Next, this manual is not written for the bench technician except for the fact that we do include board layouts and schematic diagrams. As you are well aware, most of the problems incurred in the field are not board related. If you have double checked all the wiring, the power supply, the monitor, and where possible, swapped boards and have narrowed a problem down to the board, give us a call and our crack customer service department will get you going. The game's television monitor is a self-contained solid-state unit. The composite video sent to the monitor differs in many respects from the signal derived from commercial TV broadcasts. Vhe picture appearing on the screen, therefore, is unlike that of a home TV set, and the monitor docs not produce any sound See Chapter 6 for a schematic diagram of the TV monitor. 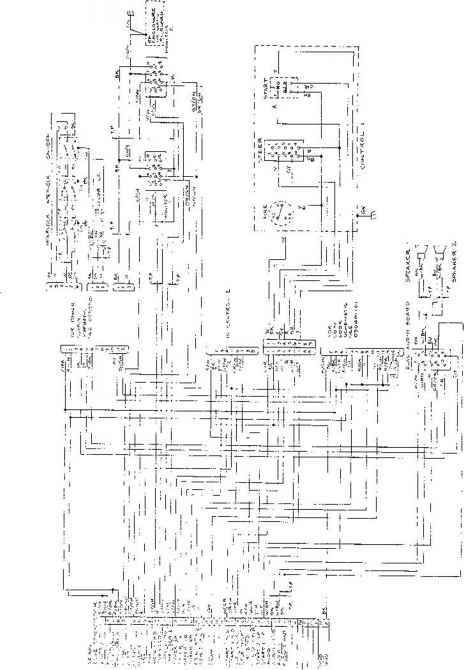 On the game PCB schematic diagram. Figure 4-2, the symbol P (appearing at various inputs of integrated circuit devices) indicates a connection of + 5 volts DC through a pull-up resistor For easy reference, the game PCB is divided into grid sections Along the short side of the board these sections are identified by letters A through P (skipping letters C, I, O and Q bccause they may be easily confused with the numbers 6,10, and 0 respectively) Along the long side of the board the numbers 1 through 13 are used. The microcomputer of the game PCB consists of a microprocessing unit (MPU), a clock circuit, a power reset and watchdog counter, NMI counter, address decoding circuit, program ROM memory, and program RAM memory. See Sheet 2, Side A of the large sheets for the schematic diagram and functional descriptions of this circuitry. This sheet also includes the schematic diagram and functional descriptions for the player control inputs to the game PCB. If your X-Y monitor develops a problem, you can go directly to the SYMPTOM DIAGNOSIS subsection where you can match up your problem to the problem described and the circuit that may be causing it. From there you go to the schematic diagrams for your particular brand of monitor and troubleshoot the circuits mentioned in the SYMPTOM DIAGNOSIS subsection. For those who know nothing of electronics, we suggest that you read the THEORY OF OPERATION subsection, and we definitely recommend that you read the TROUBLESHOOTING subsection. From there, go to the SYMPTOM DIAGNOSIS subsection, and then to the schematic diagrams the monitor's road map. 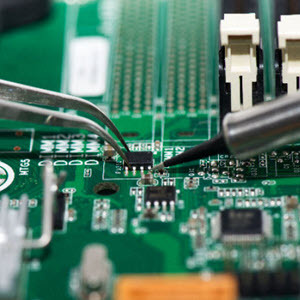 As we've outlined previously, any electronic repair procedure consists of a series of efforts to isolate a problem down to a managable level restating our Logical Troubleshooting Procedure in 6 steps, 1. Visual Inspection, 2. Symptom Recognition, 3. Symptom Isolation, 4. Function Isolation, 5. Component Isolation, and 6. Repair. This subsection gives a technical description of the game's electronic circuitry. Drawing number 005629 is a nine-sheet schematic diagram of the circuitry on the printed circuit board, and drawing number A005629 is the PCB assembly drawing showing the locations of the components called out on the schematic. The position of each integrated circuit device is identified by a column letter designation (A through R), and by a row numberdesignation (1 through 9). Drawing number 005816 is a schematic of the harness wiring inside the game cabinet. These drawings and a schematic diagram of the TV monitor's circuitry are included in Section VII of this manual. THE FOREGROUND OBJECT ROM (EXPANSION MODULE, MA-643) CONSISTS OF FOUR SERIES PAIRED 2764'S WHICH HAVE THE SUM EQUIVALENT OF DOUBLING THE MEMORY CAPACITY REQUIRED FOR THE Q*BERTS QUBES (GAME GV-119). THE LOGIC PROM KIT UTILIZED IS PK-119. SOUND PROM KIT USED IN THIS GAME IS PKS-119. SEE FIGURE 1. FOR LOCATION OF THE EXPANSION MODULE AND FIGURE 2. FOR THE SCHEMATIC DIAGRAM. THIS CIRCUIT MODIFICATION REPLACES THE K4, K5, K6 AND K7-8 PORTION OF LOGIC BOARD ASSY. (Al), SCHEMATIC DIAGRAM BOTTOM OF PAGE 21, SHEET 3 OF 3. This subsection provides a technical description of the Sprint 2 electronic circuitry. Section IX of this manual contains schematic diagrams, assembly drawings, and parts lists referred to in the following subparagraphs of this section. On the Sprint 2 PCB schematic diagram, drawing number 005922, the symbol P (appearing at various inputs of the integrated circuits) indicates a connection to +5VDC through one of the pull-up resisters R1, R2, R4, R33, or R38. The game's television monitor is a self-contained transistorized unit. The composite video signal sent to the monitor differs in many respects from the signal derived from commercial TV broadcasts. The picture appearing on the screen, therefore, is unlike that of a home TV set and the monitor does not produce any sound. See Chapter 6 for a schematic diagram of the TV monitor. On the game PCB schematic diagram, the symbol P (appearing at various inputs of integrated circuit devices) indicates a connection of +5 volts DC through a pullup resistor (see Figure 4-3). For easy reference, the game PCB is divided into grid sections. Along the short side of the board, these sections are identified by letters A through E. Along the long side of the board, the numbers 1 through 9 are used. For example, sheet 2 of Figure 4-3 illustrates the mic-roporcessor E3 at the right side of the drawing. The microporcessor is found at coordinates E and 3 on the PCB. With this manual you received three large sheets that contain the wiring and schematic diagrams for the Tempest Cocktail game. Sheet 1, Side A, includes information that shows the arrangement of these diagrams. These diagrams explain the functions of the circuits and define inputs and outputs. The locations of assemblies and components are in the parts lists in Chapter 5 of this manual. The. Printed-cir-cuit board (PCB) illustrations can aid in rapidly locating components shown on the corresponding schematic diagram(s). The schematic package supplement for this manual contains schematic diagrams with component locations, active component type numbers, and electrical values. Information in the form of instructions and data is contained in a Program Memory built up of seven type 2708 PROM's (refer to the CPU Schematic Diagram). These PBOM's are addressed by the Z-80's Address Bus. The information addressed is then applied to the Data Bus and input back to the Z-80 for processing. Occasionally, the Z-80 will have to store information in a temporary location and it uses the Scratch Pad RAM for this. Actually, there are two groups of RAM in the system, the Scratch Pad previously mentioned, and a Video RAM. The Video RAM will be discussed in a later section. For the present, it can be stated that both RAM's appear identical to the Z-80, except that they occupy different addresses. This subsection provides a technical description of the Dominos electroniccircuitry. 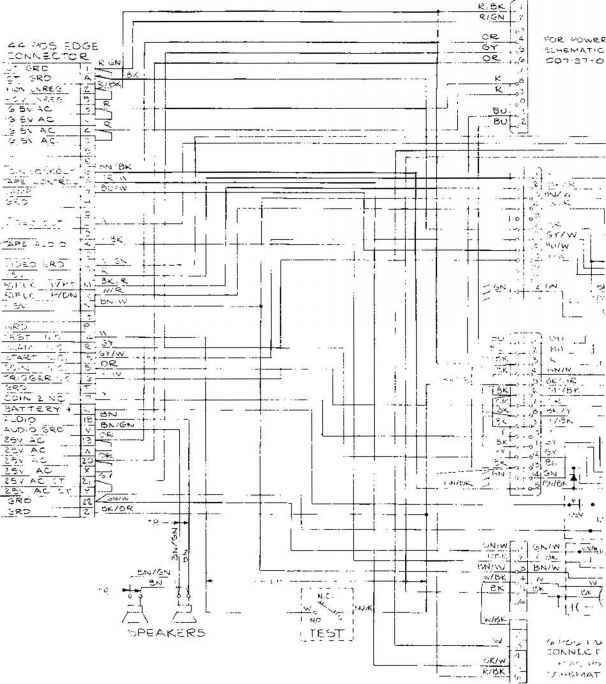 Scction IX of this manual contains schematic diagrams, assembly drawings, and parts lists referred to in the following subparagraphs of this section. On the Dominos PCB schematic diagram, drawing number 007305, the symbol P (appearing at various inputs of the integrated circuits) indicates a connection to -rSVDC through one of the pull-up resisters R1, R2, R4, R33, or R38. Electronics Repair Manuals is not for free and currently there is no free download offered by the author.